DJ Miss Brit – expect experimental grooves, house, disco, and early hip hop as well as tracks from R&B queens Solange, Jill Scott, and Erykah Badu. Miss Brit may even throw in some Latin and Afro Beat tunes with Jennifer Lopez and Yemi Alade. DJ Mike 2600 – the 20-year DJ veteran will continue the evening with classics from the 70s through the 90s: think Diana Ross, Whitney Houston, Fleetwood Mac/Stevie Nicks, Donna Summer, Amy Winehouse, and Madonna. Mike tells us he’s got some classic hits as well as some deeper cuts. Ysheyellin (aka Mina Moore) – targets the 80s and 90s, with tracks from Janet Jackson, Toni Braxton, and Brownstone. Plus, get ready for some prominent female MCs of the same era; we’re talking Latifa, The Lady Rage, and MC Lyte. DJ Bonics – wraps up the night and complements with some hits that were missed. The 90s will be a major focus with Expose and others. Then, it’ll be time to step out of the 90s and back to today with some contemporary divas like A9, Kelis, and C3. 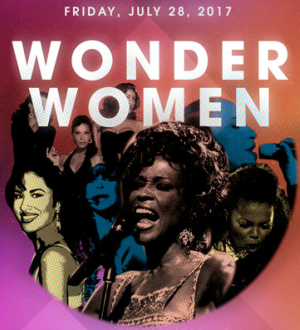 We’ve got a stellar line-up of DJs and an endless list of important female musicians to feature, making Wonder Women a can’t-miss dance party from beginning to end. Head to First Avenue July 28 for an eclectic night celebrating years of influential female musicians. Get your tickets here!